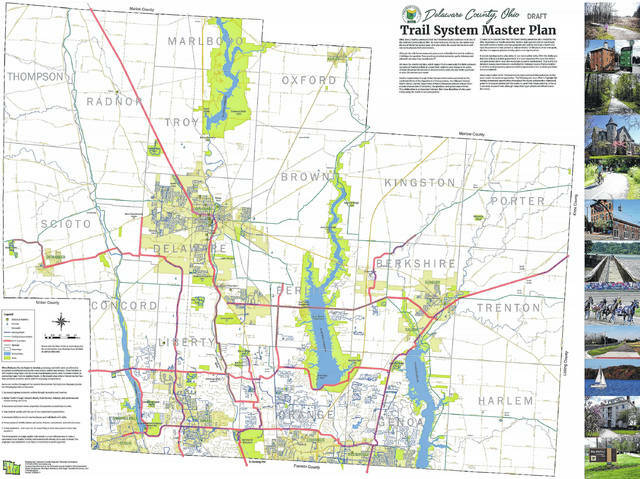 Draft MapDelaware County Trails Committee draft Trail System Master Plan. The county will host an open house from 4 to 6 p.m. Thursday at Willis Education Center to allow residents to offer feedback about the plan. The Delaware County Trails Committee is seeking input from local residents regarding the countywide, multi-use trail plan. The committee has scheduled a public open house for Thursday, Nov. 2 from 4 to 6 p.m. at the Willis Education Center, 74 W. William Street, Delaware. Economic Development Coordinator Jenna Jackson said in an earlier report by The Gazette, that during a majority of the meetings with stakeholders for the county’s economic plan last year, residents talked about having a countywide trail system that would connect communities. The committee was created in August 2016 by the Delaware County Board of Commissioners. The committee includes county residents, representatives from Delaware County Economic Development, the Delaware County Regional Planning Commission, the Delaware County Engineer’s Office, the Delaware General Health District, Preservation Parks, and the Mid-Ohio Regional Planning Commission. Commissioners have charged the committee with three objectives: creating a conceptual multi-use trail plan, helping local jurisdictions identify funding sources, and developing trails in conjunction with regional plans. Since the committee was formed, it has researched, held meetings with officials from Delaware County’s cities, villages, and townships throughout the process, prepared a plan that includes area maps of existing and needed trails, as well as the potential funding options for commissioners to approve. The committee will have maps and draft copies of the plan for the public to view and to leave comments. The open house will be held immediately following the Partnership for Healthy Delaware County meeting, also held at the Willis Education Center.